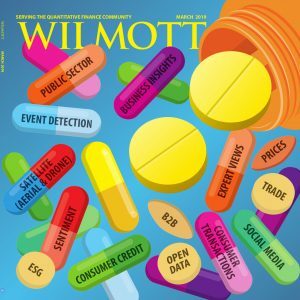 HomeWILMOTT MagazineWilmott Magazine: March 2019 issue – 100th Issue! “Contents,” Wilmott, vol. 2019, iss. 100, p. 1–1, 2019. D. Tudball, “Getting to be a habit,” Wilmott, vol. 2019, iss. 100, p. 2–3, 2019. “News,” Wilmott, vol. 2019, iss. 100, p. 4–9, 2019. A. Brown, “Liquid alts,” Wilmott, vol. 2019, iss. 100, p. 10–11, 2019. F. Siboulet, R. Kumar, R. Douady, and S. Crepey, “Libor inside out: transition and challenges,” Wilmott, vol. 2019, iss. 100, p. 12–29, 2019. R. Poulsen, “Cross‐currency betting arbitrage,” Wilmott, vol. 2019, iss. 100, p. 30–31, 2019. U. Wystup, “Exit strategy for a sick floan,” Wilmott, vol. 2019, iss. 100, p. 32–35, 2019. D. Tudball, “Alternative medicine,” Wilmott, vol. 2019, iss. 100, p. 36–43, 2019. P. Wilmott, “The pleasure and pain of investing: parallels with exotic options,” Wilmott, vol. 2019, iss. 100, p. 44–51, 2019. S. D. Moffitt and W. T. Ziemba, “A risk arbitrage strategy for lotteries,” Wilmott, vol. 2019, iss. 100, p. 52–63, 2019. L. Zyapkov, “Forward volatility on a gamma clock and the relativity of time in financial markets,” Wilmott, vol. 2019, iss. 100, p. 64–73, 2019. C. Huber, “Machine learning for hedge fund selection,” Wilmott, vol. 2019, iss. 100, p. 74–81, 2019. M. Radley, “Cars,” Wilmott, vol. 2019, iss. 100, p. 82–83, 2019. J. Darasz, “The skewed world of jan darasz,” Wilmott, vol. 2019, iss. 100, p. 84–84, 2019.